What happens when a pack of wild animals breaks into your house to throw a party? Jake is about to find out. 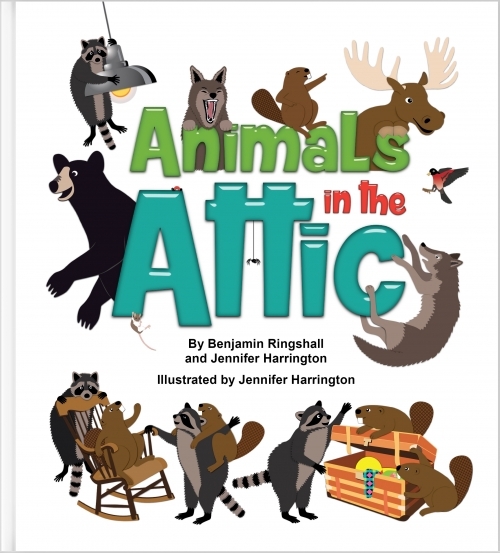 Animals in the Attic is an epic tale of animal home invasion and partying. Do you have bats in the belfry? Bees in the bonnet? Ants in your pants? Well don't fret, 'cause we've got ANIMALS IN THE ATTIC!! Our stuffed wild animals help bring this tale of animal home invasion to life! Lots of cool FREE stuff! Join our fans and supporters on our mailing list, where you'll be the first to find out about all our of upcoming projects, and get loads of FREE goodies! Welcome to Eco Books 4 Kids! 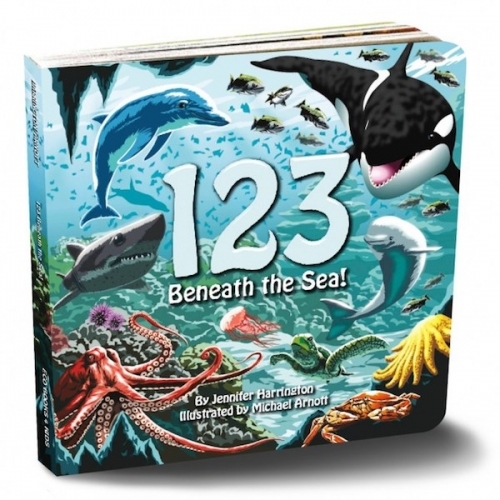 entertaining, educational, eco-friendly children’s books. 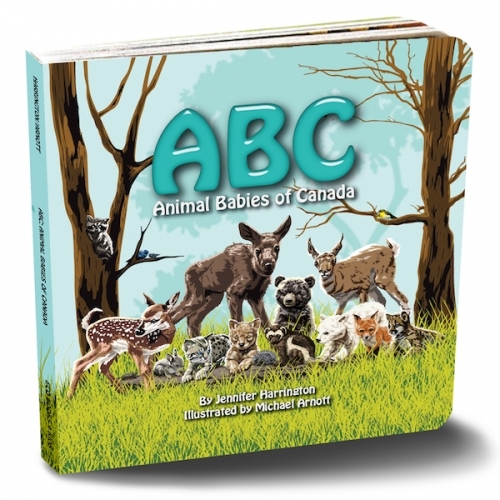 Eco Books 4 Kids is a publishing company devoted to creating entertaining children’s books about Canadian wildlife. Each book has associated educational resources designed specifically for teachers, which are available for purchase in our ‘Education’ section. And while you’re there, check out our FREE animal profiles! 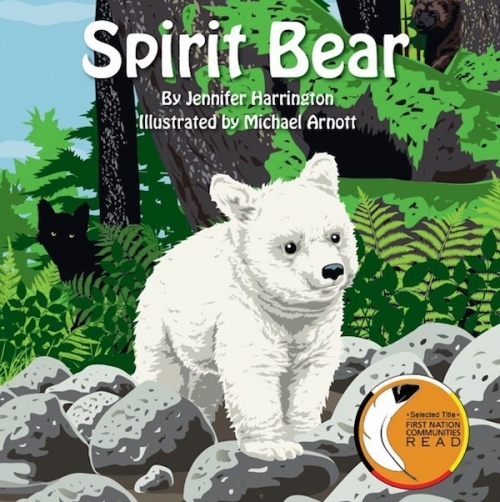 Click the links to the right to view the profiles for each animal from Spirit Bear. A spirit bear is a special kind of black bear that is born with white fur. Black bears that are able to have white cubs are called Kermode bears. 1 in 10 Kermode bears will be born with white fur. In the fall/autumn they eat salmon. In spring and summer they eat plants, berries, mussels and anything else they can find. White bears are 30% better at catching salmon than black bears because the salmon can’t see them well from underwater. They hibernate in dens in hollows beneath old cedar trees for 3 – 5 months in the winter. The mother bear wakes up from hibernation to give birth to 1 – 4 cubs in the den. Cubs are born blind and hairless, and spend their first months in the den nursing and sleeping. They leave the den in the spring. Cubs stay with their mother for 1 – 1.5 years. The mother drives the cubs away when she’s ready to breed again. There are about 200 spirit bears in the world, and they all live in the Great Bear Rainforest. They are rarer than panda bears. Spirit bears can live for up to 25 years in the wild. Black bears in the Great Bear Rainforest may give birth to white cubs, and white spirit bears may give birth to black cubs. They mate between May and July. Like other bears, the female doesn’t become fully pregnant until it’s time to hibernate. If a female bear is unable to gain enough weight during the summer and fall, her body will tell her not to proceed with the pregnancy. They hibernate in dens in hollows beneath old cedar trees for 3 – 5 months. The mother bear wakes up from hibernation to give birth to 1 – 4 cubs in the den. 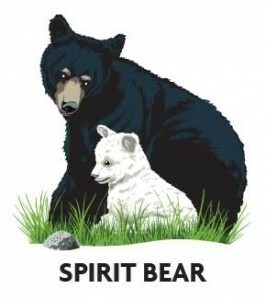 A local native group, the Gitga’at, gave the spirit bear its name, which is ‘Moksgm’ol’ in their language. They believe it is the guardian of the rainforest. With only about 200 spirit bears in the world, they are rarer than wild pandas. Spirit bears can live for up to 25 years in the wild. Unlike other wolves, sea wolves can swim like otters, and fish like bears. They are uniquely adapted to life in the rainforest and are smaller than other wolves. Their jaws are 7 times stronger than ours. They use their teeth to kill their prey. They mainly eat black-tailed deer and salmon, but will also eat seals and beached whales, and sometimes even attack bears. They also eat crabs, shellfish, birds, small mammals and rodents. Though wolves are mostly carnivorous (meaning they eat fish and meat), they also eat grass and berries at times. They are great swimmers and will swim up to 13 kilometers (8 miles) across ocean channels to find food. Unlike bears that eat the whole fish, sea wolves usually only eat the heads of salmon. Eagles, ravens and even bears will eat the rest. In the fall they fish for spawning salmon, catching them with their teeth and dragging them to shore to eat. Sea wolves usually only eat the heads of the salmon. Eagles, ravens and even bears will eat the rest. They live in large families called packs led by a male and a female. They mate in early winter, and females give birth in dry dens in the spring. Male and female wolves usually mate for life. Females have a litter of 4 – 7 pups, which are born blind. They are cared for by the pack until they 10 months old. They are cared for and protected by the pack until they 10 months old. 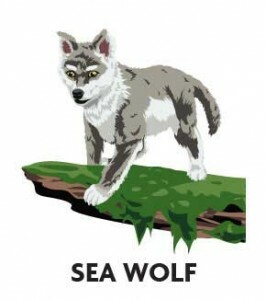 Sea wolves can live for up to 10 years in the wild. They can be black, grey or white, but are usually brown with a red tinge. Black-tailed deer live in forests on the coast. In spring they eat plants and herbs. In winter they eat berries, grass, lichen, nuts and shrubs. Their main predators are wolves and cougars. They are good swimmers and often swim to find food. Only bucks (males) have antlers, which they lose in the winter. Their antlers fall to the forest floor and small animals chew on them to get nutrients. Black-tailed deer breed in November and December. A male deer is called a buck, a female deer is called a doe and a young deer is called a fawn. Newborn fawns nurse soon after birth and can walk almost right away. For the first few weeks of life, fawns nurse from their mothers, whose milk is more than twice as rich as the best cow’s milk. Younger does give birth to one fawn, while does 3 – 9 years old often have twins. Adult bucks don’t help to raise fawns and will either remain solitary or will form bachelor groups throughout the summer. In winter, deer may be observed in larger groups. 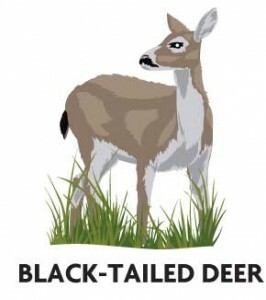 Black-tailed deer live for about 10 years in the wild. They are also sometimes called mountain lions, pumas, panthers, or catamounts. They are secretive and solitary, and hunt at night. In the Great Bear Rainforest they mostly hunt black-tailed deer, but will also eat small animals at times. Cougars stalk rather than chase their prey and are so stealthy they are rarely seen. Some cougars can eat porcupines without being harmed. Cougars are good swimmers, but they don’t like getting wet. Cougars whistle, squeak, growl, scream, purr, hiss, and yowl, but they can’t roar. Cougars can jump 5.5 meters (18 feet) from the ground to a tree. 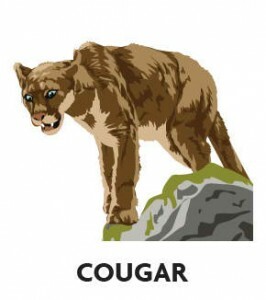 Cougars mate in winter and early spring. Females have litters of 2 – 4 kittens in the spring. Cougar cubs leave their mother when they are 2 years old. Female cougars usually have one litter every other year. At 2 years of age, the cougar cubs will leave their mother to start their own lives. 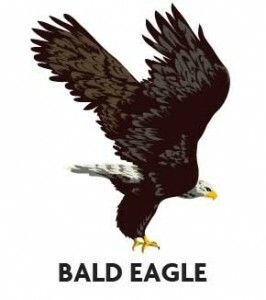 The bald eagle is a bird of prey, or ‘raptor’. Their nests are used over and over for many years, and are the largest of any bird in North America. They live in forests near lakes, rivers, oceans and marshes. Eagles mostly eat fish such as salmon, but will also eat small mammals and other birds. They will capture their food, scavenge it or steal prey from other animals. Bald eagles mate for life, but if one dies, the other will choose a new mate. When it’s time to breed, they often return to the area where they were born. They lay 1 – 3 eggs at a time in their large nests. Males and females take turns sitting on the eggs, but the female does most of the incubating. While one parent sits on the nest, the other hunts for food. Eggs hatch from April to May. The young leave the nest from late June to early July. Bald eagles live for up to 20 years in the wild. 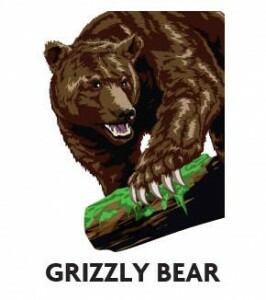 Grizzly bears can be off-white, tan, yellow, brown or black. The grizzly has a hump of thick muscle on its back that makes the bear a strong digger. They are omnivores, meaning they eat both plants and meat. They eat plant roots, fruits, berries, grasses, and flowers. They also eat fish (especially salmon), rodents, carrion (dead animals), moose, elk, caribou, and deer. Grizzly bears communicate with sounds, movement and smells. If a female bear is unable to gain enough weight during the summer and fall, her body tells her to end the pregnancy. They mate in spring and early summer. The female doesn’t become fully pregnant until hibernation. The female grizzly has 1 – 4 cubs in the den in winter. Cubs are born blind and furless and weigh 1 pound. They nurse and grow inside the den for 4 – 5 months. When the cubs are 2 years old, the mother drives them away. Grizzly bears can live for up to 30 years in the wild.